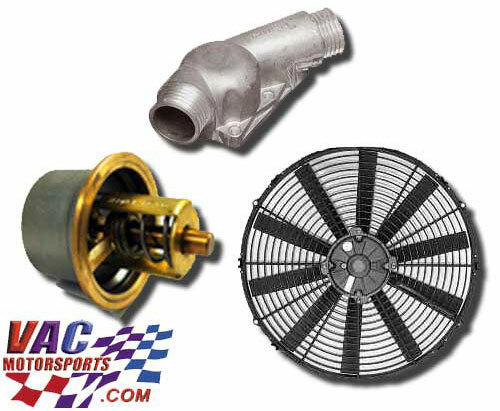 The VAC High Performance Cooling Kit for the E36 is a great help in adding reliability to your street or track car. It addresses some of the tired or weak points in the E36s cooling system. The new thermostat helps the coolant get to the radiator quickly. The Aluminum Thermostat Housing resist aging and cracking, and the high efficiency SPAL puller fan helps eliminate silly clutch fan failures and parasitic losses. Optionally, a Stewart metal impeller equipped High Performance Water Pump is more durable and offers better efficiency over OEM. Suitable for both street and track use, this is a great kit to have for all E36s! E36s; M3s especially, are sensitive to overheating. High water temps can not only cause loss of power and burst expansion tanks, but head gasket failure, detonation, and permanent engine damage!